The oldest translation by different translators. Note the difference in the title for . 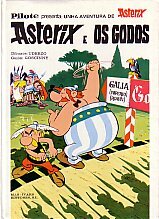 T. J. Kinne remarks: On the title page of "Asterix e Cleopatra", the sentence "A maior aventura xamais dibuxada" was misspelled ("jamais") - all the albums carry a sticker with the right spelling over the wrong one. Additions by Frederic Garriga Xifre and María Xesús Bello Rivas. First three titles in one volume.